← Thought for Thursday…..a tribute to my best friend. This just in……inner child goes berserk! A tragedy was barely averted in downtown Norfolk, Virginia recently when a man’s inner child escaped and ran amok on the banks of the Elizabeth River. 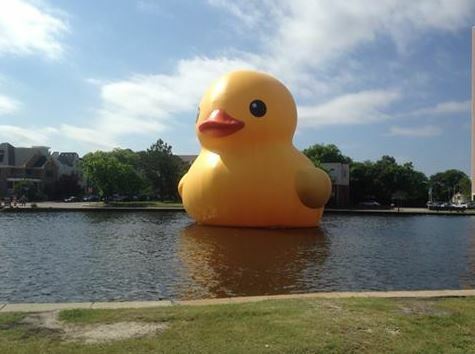 Strolling casually along, the man suddenly came upon a 40-foot rubber ducky that was on display in this coastal city. It was then that his inner child, little Alfie, burst forth from his psyche and began to scream and shout “my ducky, my ducky” over and over again. When interviewed, the child, now safely ensconced in the body of his grown self again, known to us all as Big Al, remarked; ” I don’t know what came over me, I normally have total control of my inner child but I guess I just wasn’t paying attention.” With that, he calmly left for home, clutching his teddy bear “snuggyboo” ever so lovingly. This entry was posted in "This just in...." and tagged inner child, Norfolk, rubber ducks, Virginia. Bookmark the permalink. 26 Responses to This just in……inner child goes berserk! Nobody seems to have asked the question…..
Why was there a massive yellow duck in the river? Why, where else would you put a 40 foot rubber duck? We’ve had them here too sometimes… they do rubber duck river races sometimes 🙂 Great fun! Hi Lorna, this is Alfie. I dumped that old guy, he was really cramping my style. Do you want to come out and play? The giant rubber duck was bound to cause trouble on the loose in the big city. Agree, Patti, what were they thinking? Can I play with your ducky sometime? If you have a semi with flat bed trailer, then yes. I never realized I had so many friends so fowl. I was hoping to get though life without anyone finding out about this schizoid side of me, but a 40-foot rubber duck…… that just isn’t fair! P.S. Snuggyboo is interested…does Toni have an EHarmony profile? Did you see it while you were here? Saw it on TV, Facebook, and the newspaper! Perfectly understandable. As long as Little Al didn’t break into a chorus of “Rubber Ducky, I love You” in his best Ernie voice. It’s Big Al’s singing voice you need to be worried about, believe me. There was some mention of a distant cousin around London, but I’m sure it must be someone other than the esteemed Mr.Wells….. Thanks, Jane. Hope you’re feeling just ducky yourself.